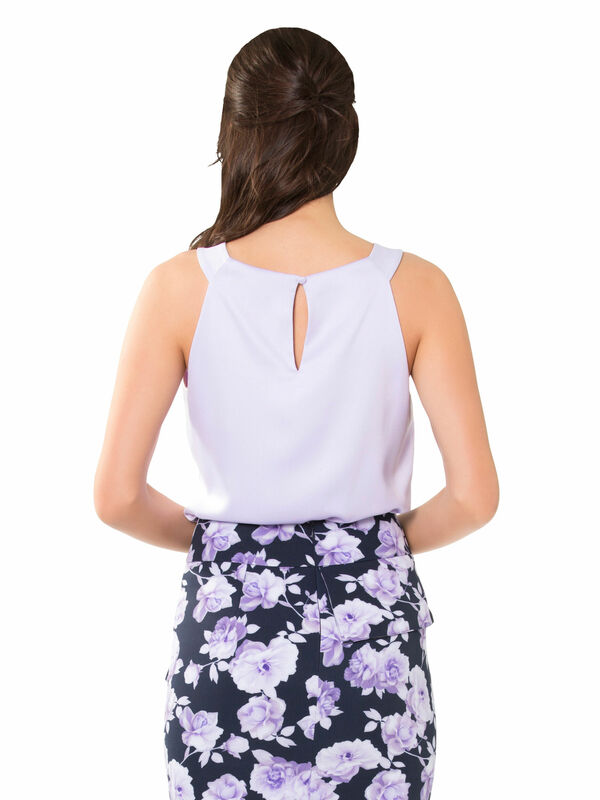 Montessori Top https://www.review-australia.com/au/montessori-top-purple/RE19TW019.REPUR008.html Sleek, simple and endlessly feminine, the Montessori Top adds polish to any wardrobe. The sleeveless top is made from a satin-feel fabrication with a smooth finish. Its gathered high neckline meets broad straps and is offset with a keyhole back neck closure. Paired with a pencil skirt or slim fit trousers it makes for a sophisticated day-to-night choice. Sleek, simple and endlessly feminine, the Montessori Top adds polish to any wardrobe. The sleeveless top is made from a satin-feel fabrication with a smooth finish. Its gathered high neckline meets broad straps and is offset with a keyhole back neck closure. Paired with a pencil skirt or slim fit trousers it makes for a sophisticated day-to-night choice. Montessori Top is rated 4.7 out of 5 by 45. Rated 4 out of 5 by lizzieb03 from Super comfy! This top makes me feel very feminine which I love. It's a beautiful colour and the neckline is a nice unique feature. The top is flowy which makes it comfortable to wear. I have an hourglass figure and even though tuck it into my skirt it is still lose fitting in the all the right places. You can match it with a pink skirt for an ultra feminine look. It does require ironing but you can't win them all! Rated 4 out of 5 by Elly from Great summer top I tried this on a few weeks ago in store and put it back on the rack because I did not like how you would need to wear a strapless bra with the top. However I did like the comfortable fit and how flattering top it is, so when it came on sale with an extra 40% off I jumped at the chance. I do like this top, however i would have liked the arms to be slightly wider. Rated 5 out of 5 by Teasparrow from Very happy I saw this blouse online and fell in love with it. When it arrived, it was even more stunning in person! High quality fabrics and a beautiful style. Perfect for work or a party. Pairs well with all of my review skirts. I would highly recommend this top. Rated 3 out of 5 by NattyD from Pretty top Pretty top but I found that it didn't look that great on when I received it (bought online), so I ended up returning it. I did size down as someone else mentioned to do (I'm between an 8 and 10) and the 8 was a perfect fit. However, just not for me. Rated 4 out of 5 by Rachndale from Beautiful colour I ordered this online in a size 12 as I normally take a size 12 for Review items. I loved it when I received it BUT it is way too big! It gaped everywhere. I have returned it and exchanged it for a size 10. Fingers crossed that the 10 will fit! Rated 5 out of 5 by Elle123 from Pairs with almost everything This top is just gorgeous! I bought it in a lilac, and it is so comfortable and I can mix and match with several different skirts and pants. Be careful not to snag the fabric, it’s very delicate. Rated 5 out of 5 by Hello dolly from Simple and elegant Beautiful, simple and elegant top that is flattering. I bought the white and it works well with pretty much anything and balances out all my patterned and bold skirts. Thanks review!